Very nice tour. Guide from Emo Tours was very knowledgeable on subject and was very nice and always concerned about our well being. Also, great driver navigating Cairo traffic. I did two tours with this company, Emo Tours -- a full day tour of the Giza pyramids, etc. and the following day to the city of Alexandria. On both days my tour guide was Manur Mahmoud and the driver Hani. What a wonderful team they were! Manur was clearly very knowledgeable on the subject of Egyptology, very enthusiastic, and thoroughly professional in the way she organized our excursion. Hani the driver was considerate and accommodating. They picked me up from the hotel both days, and Hani waited patiently while Manur and I explored each sites, always having the air-conditioned car right there ready for us when we came out. They had great snacks and water for me in the car and organized a wonderful lunch on the day of the pyramids tour. I could not have asked for better service. I would highly recommend this team for any tour of Egypt. Thank you, Manur! Thank you Hani! I had the best day with Hana, and the driver Ahmed. Hana is so warm, collegial, and knowledgeable. She took the time to explain things to me when I had other questions. She also made sure I had time learn about papyrus, and head to a gold and silver shop to look at cartouches. She was an excellent guide and I would highly, highly recommend you ask for her! Our day tour to Giza, Sphinx, Memphis and Saqqara was amazing, our guide Marwan arrived at our hotel promptly at 8:00 to start our day. He was attentive throughout the day and very knowledgeable. The pyramids were breathtaking and Marwan made sure we got the best photos! He had experience taking the most unique pictures and never seemed to tire of taking tons of them. There was some confusion regarding whether this tour included lunch. Marwan saw my concern and immediately rectified the issue by taking us to a nice restaurant in Saqqara- the Pharoh. The food was good and the place was nice and clean. He picked up the tab for lunch and told us no worries. Marwan is an experienced guide and Egyptologist. We learned so much history and had a wonderful day. I booked this online because of the price and overall, good reviews. I must say, our tour guide - Bossi - is AMAZING. She's incredibly knowledgeable. She later told us she studied archaeology which made a lot of sense since she knew exactly which sites were still being excavated/restored/poor condition etc. She was also able to tell us what everything looked like inside even the sites we didn't have access too because she had been in all of them when she was an archaeologist. She was also very direct and straightforward actually told us NOT to go into the burial chamber of the Great Pyramid as it was a long walk, super hot and just an empty room at the end, lol. She was never pushy. On the contrary, my husband really liked her because she would shoo all the vendors away when they started to come towards us. Brought us to the papyrus and aromatherapy stores, but wasn't pressured to buy anything. I had requested going to Gad to get some falafel because that's what I read online, but she suggested Filfela which was a restaurant the locals went to instead. Really good and cheap! Ironically, I had wanted to book a tour for the Egyptian Museum and Coptic Cairo the next day and wanted her to be our tour guide after I met her on THIS tour, but she informed us Emo Tours was sold out. I managed to book something later that night and much to my surprise, Bossi showed up the next day as her previously scheduled tour was cancelled. It was kismet! 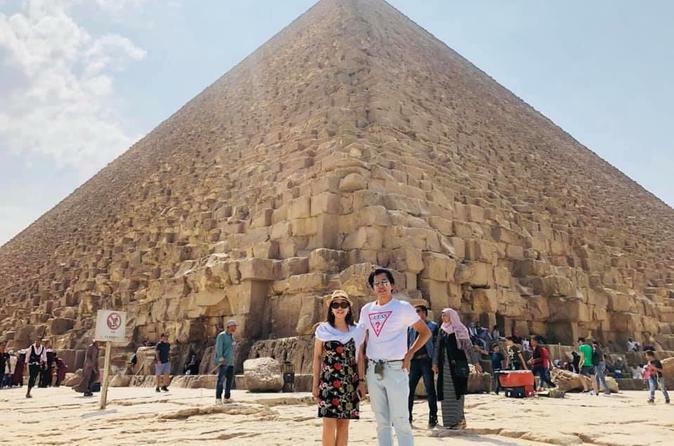 We later travelled to Luxor and ended up comparing our tour guide there to Bossi as we figured she was the gold standard for tour guides, lol. We ended up Whatsapp messaging her to tell her that we missed her and wished she was doing our tours in Luxor. If we could give her 10 stars, we would. We plan on returning to Egypt again and told Bossi we wanted her to accompany us on ALL of our future tours in Luxor and Aswan - which she said she could do if we specifically requested her. We booked this tour at 23:00 for the next morning to start at 8:00am. We didn't think it would happen since it was so last minute so when we showed up in front of the hotel and our guide was there it was a relief! Ayman Gabry was our guide and his friend Mohamed was the driver and it was an amazing time! He was very knowledgable and answered alot of questions! He even booked a Nile cruise for us that same day. Hard worker and good guy. I recommend his services! Marwan came on time to the hotel and was very accommodating and informative. On our way to tour - he gave us an overview of the places we will be visiting in. Marwan has a full knowledge and was very kind enough to carry our bags while we are taking pictures - he himself even took a pictures of us - we are very pleased to have Marwan as our guide for that day. With this, we highly recommend Marwan on the tourist upcoming tours. This is good private tour. The driver and guide picked us from our hotel and took us to Giza first. He knows important information about Pyramids and Sphinx and took us to good photo spots. This tour doesn't include entrance fee, so I recommend you to bring more than 100 dollars worth Egyptian pounds. Since my husband and I worried about we had enough cash and couldn't enjoy shopping much. Of course US dollars is available to use most souvenir shop. I recommend you to bring small 1, 5,10 US dollar bills a lot. Because after we negotiated the souvenir price and paid the money, they often said We don't have enough change and we had to pay more than the deal, so don't give them large bill. Anyway after Giza we visited Memphis and Saqqara and enjoyed Ramses II statue and Alabaster Sphinx . In this price, private tour car, driver and tour guide are included is amazing. Highly recommend. Totally recommended and worth it! Walid was an excellent tour guide! He was knowledgeable and helped me understand the history and monuments of ancient Egypt. The great pyramid of Khufu and the artifacts in the grand Egyptian museum are totally mind blowing. Incredible!